A 55-year-old woman complains of generalized fatigue, weakness, inability to climb stairs, arthralgias, and dysphagia. 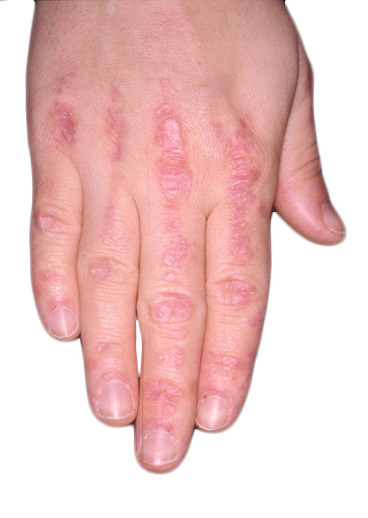 Physical examination reveals definite proximal muscle weakness, a periorbital heliotrope rash, and skin findings associated with the hands (shown here). girdle are mainly affected in a symmetric pattern. squatting or sitting position. Dysphagia is also seen. Approximately 20% of patients have an associated malignancy. Laboratory tests include elevated serum creatine kinase or aldolase, or both. Electromyographic studies and a muscle biopsy can also provide additional diagnostic information. The mainstays of treatment are systemic steroids. Other options include immunosuppressant agents and hydroxychloroquine. Those who are older and have severe myositis, dysphagia, associated malignancy, and a poor response to corticosteroids have a poorer prognosis.